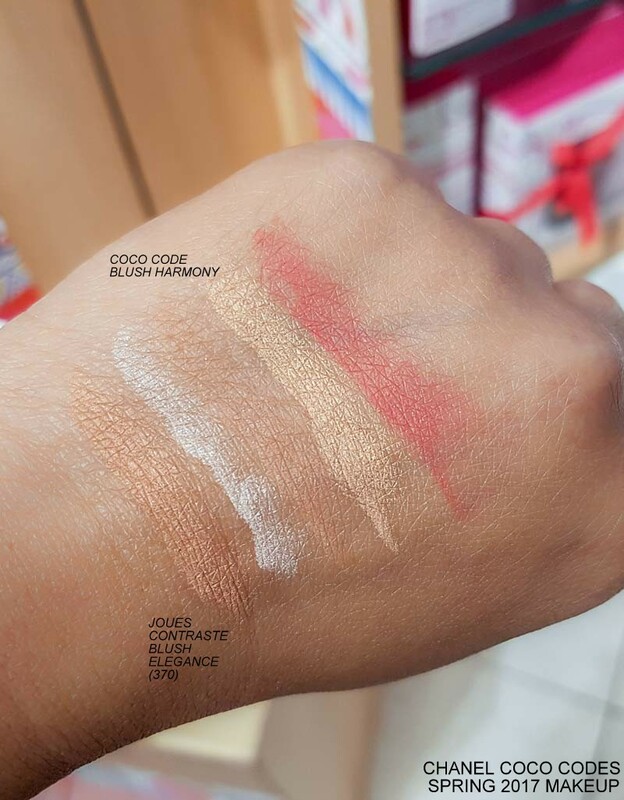 There are two blushes in this collection - Joues Contraste blush Elegance and Harmonie de Blush palette Coco Code. Elegance is a warm peach-brown shade with some fine shimmer mixed in. 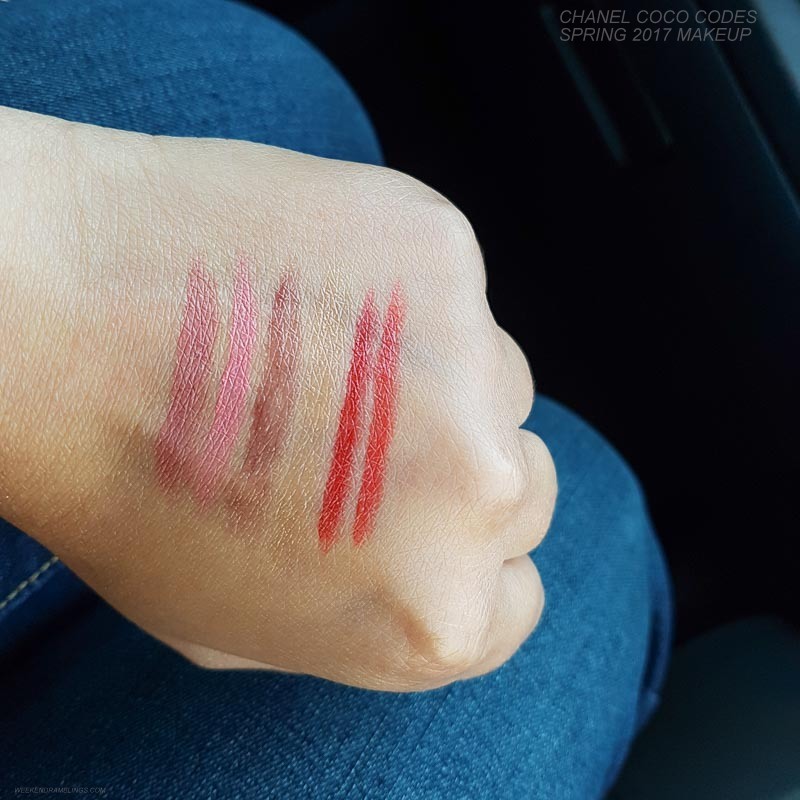 Coco Codes blush palette has 4 colors in it that can work as highlighter, bronzer, and blush. 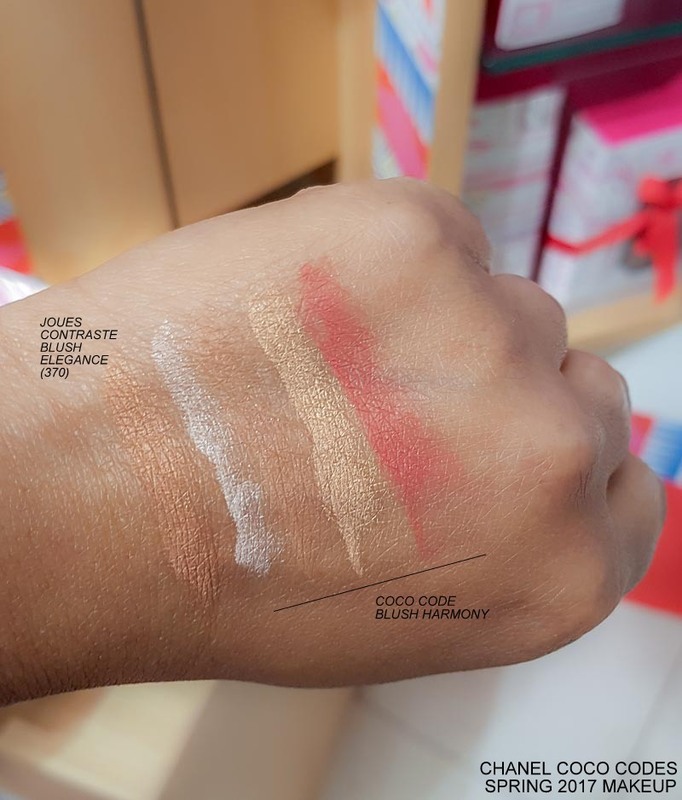 The blush color is a coral-red shade that seems perfect for spring, and the 2 highlighter shades (gold and pearl pink) would work great on most skin tones. 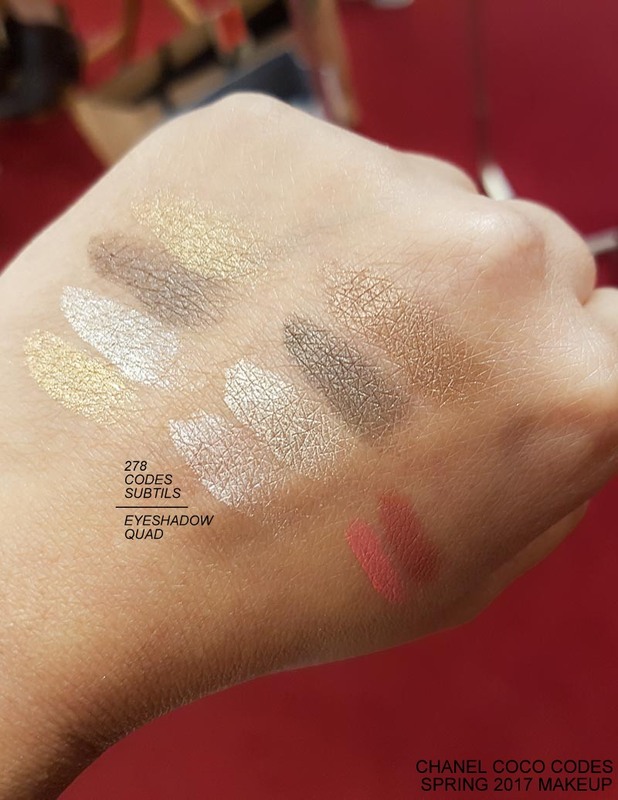 The bronzer shade - a warm brown - almost disappears against my medium-dark skin tone, but it does help enhance the blush color as well as warm up the skin tone. These colors can be used on their own or swirled/layered together. 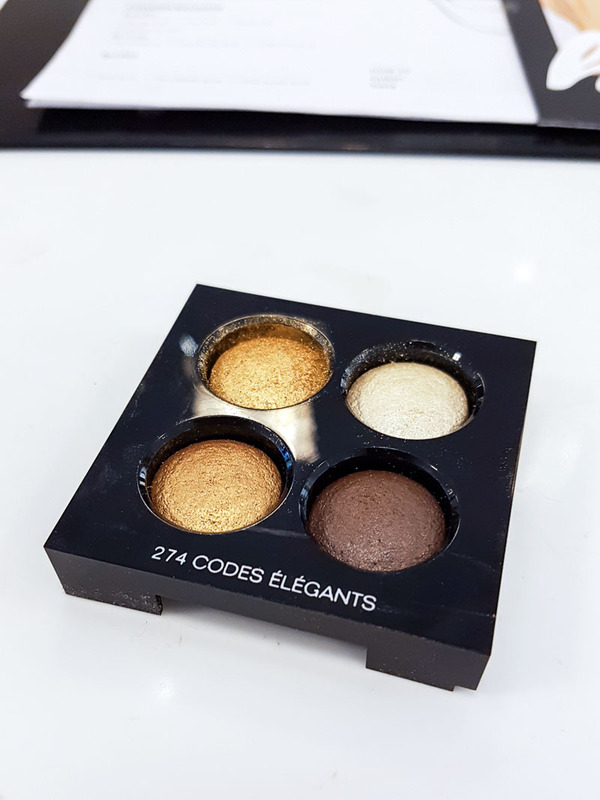 There are two eyeshadow quads in this collection - Codes Subtils and Codes Élégants. 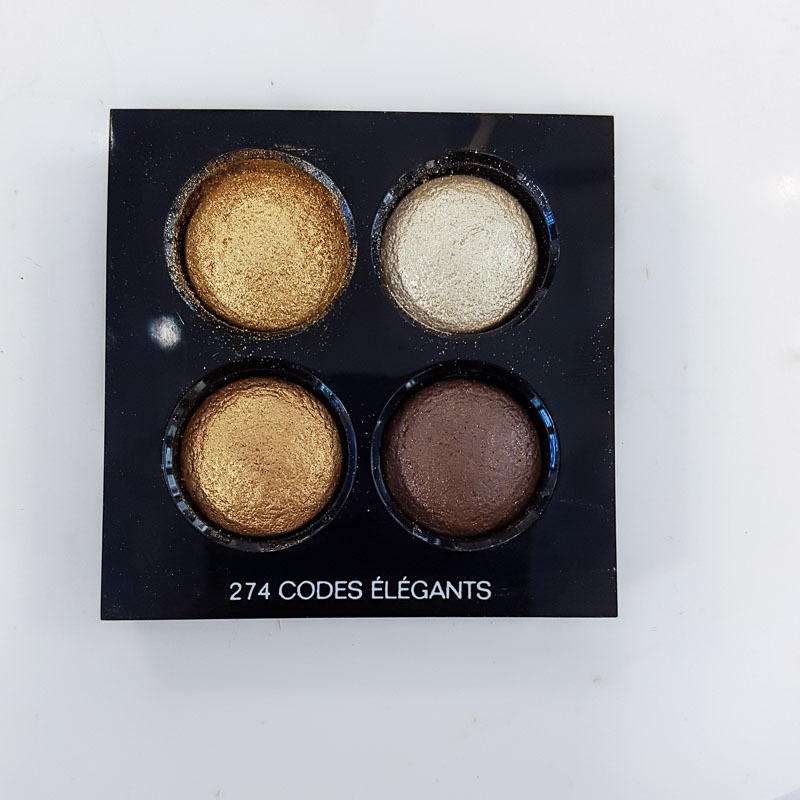 Both quads have shimmery colors, but the eyeshadows are creamy smooth and pigmented. The formula feels quite soft and seems easy to blend. 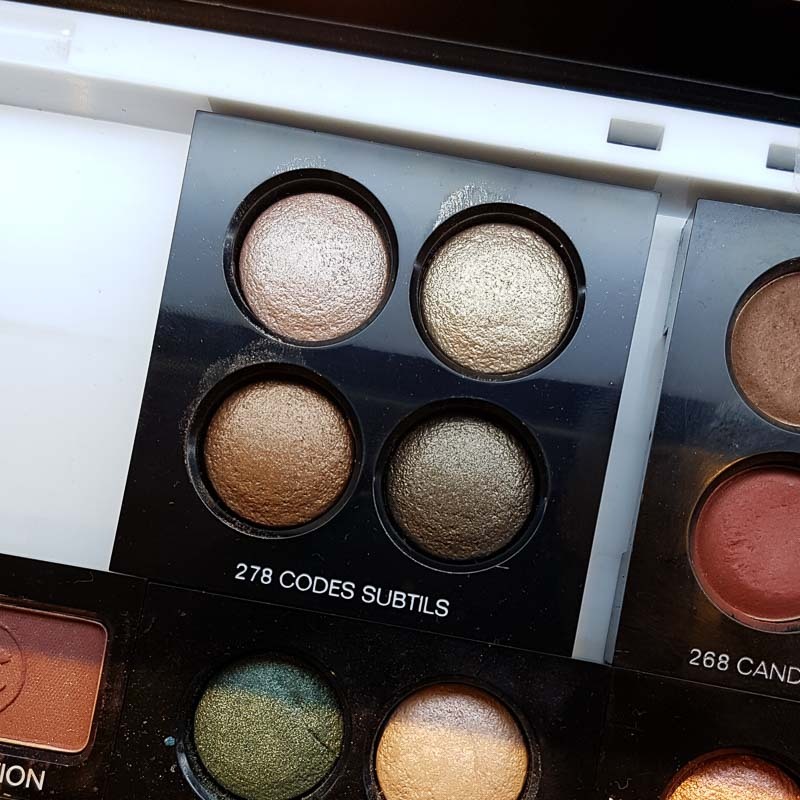 These shadows can be used as sheer washes of color for softer looks or built up and combined for deeper, more intense metallic or smokey eye looks. 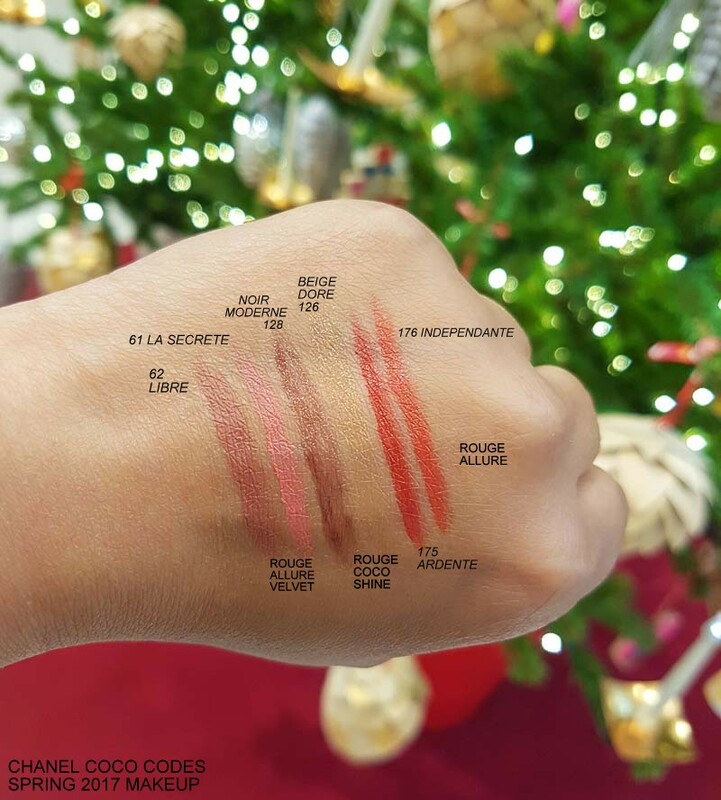 There are 6 lip colors in this collection: Rouge Allure Velvet Lipsticks in Libre (mauve beige) and La Secrète (light strawberry pink) - Rouge Coco Shines in Noir Moderne (sheer brownish plum) and Beige Doré (sheer shimmery gold) - and Rouge Allure lipsticks in Ardente (poppy red) and Indépendante (orange red). 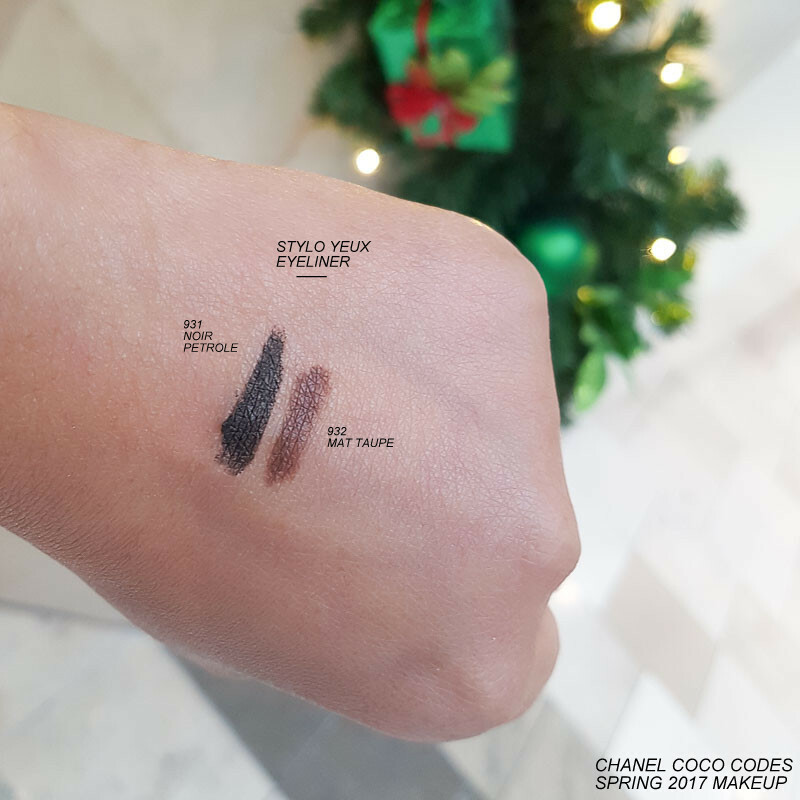 Chanel Coco Codes collection also includes 3 nail colors (Rouge Red, Blanc White, and Beige Beige), a black tinted top coat (Black Metamorphosis), as well as two waterproof eyeliners (Stylo Yeux - Noir Pétrole and Mat Taupe). 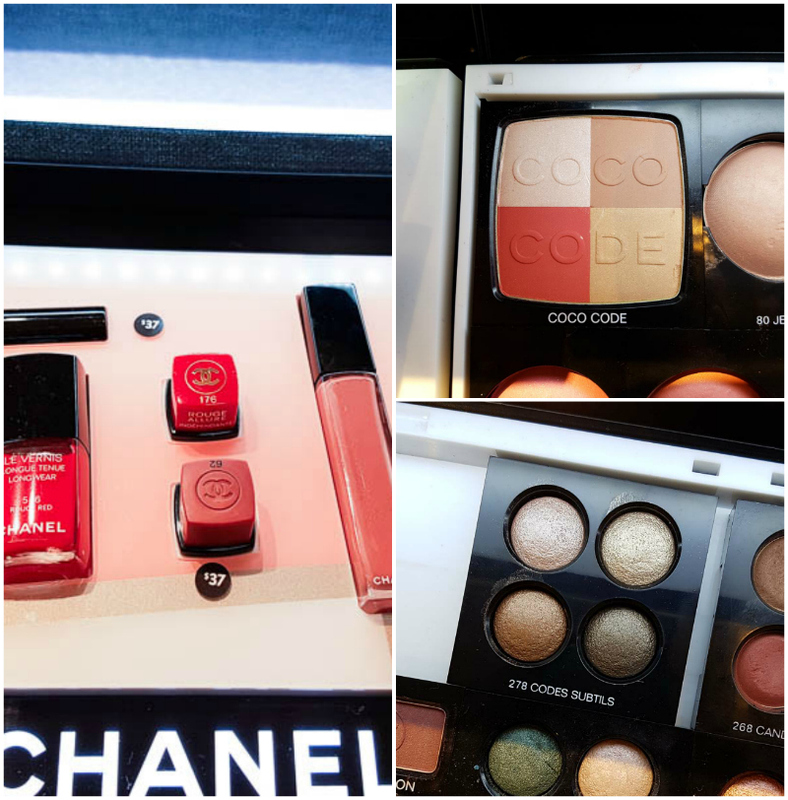 Chanel's spring makeup collection with its golds and reds does seem quite appropriate for the holidays, so perhaps it's good Chanel launched it this early. 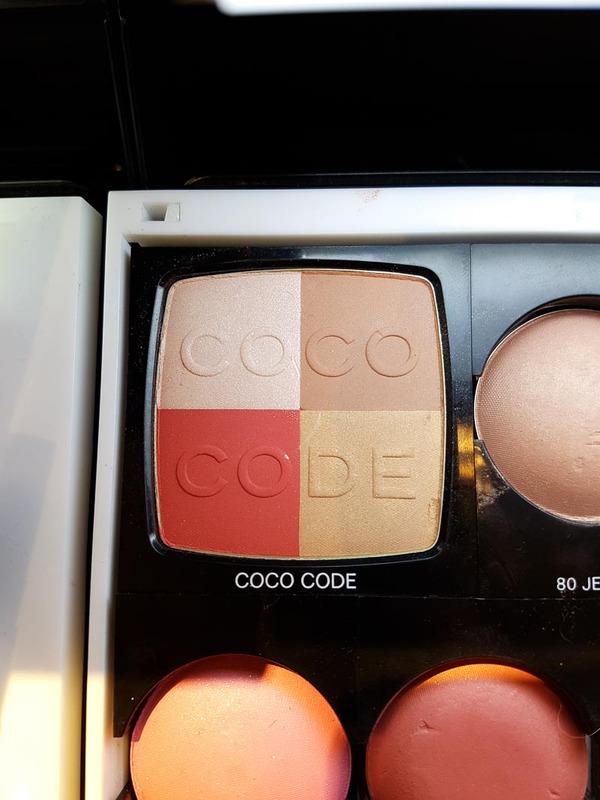 I do think the colors would work well for spring too, though, especially the Coco Code blush palette (which is my favorite in this collection) as well as the lip colors. 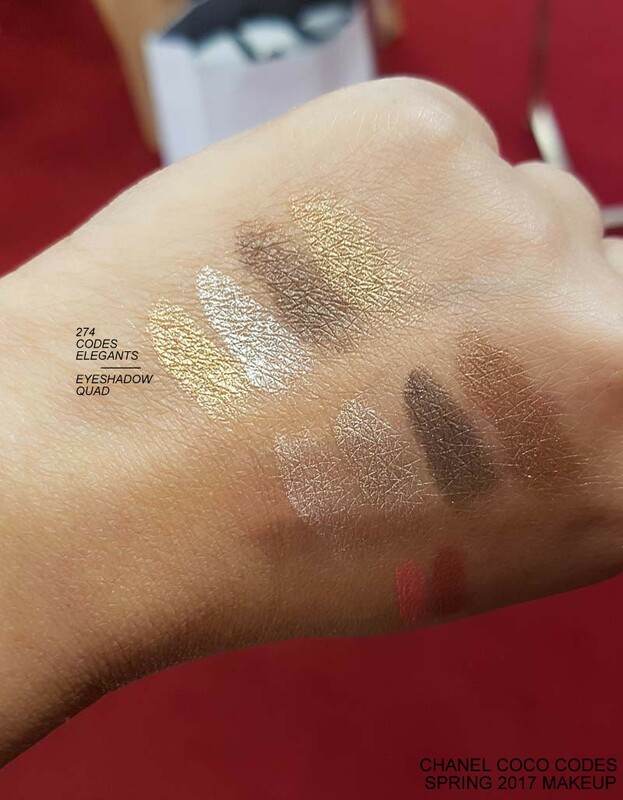 I loved the colors in the collection, especially since nothing is cool toned and despite all the gold and shimmer in there, the overall effect is subtle and elegant.